Mathias Jaeggi, Co-Founder of Impact Hub Manila, is telling us his journey and what it really takes to open an Impact Hub. “There are a couple of things I did which most people wouldn’t consider as “normal”: participating in the Gigathlon 2007 as a runner, performing a half-marathon per day for 7 days; cycling around Europe in 100 days; paragliding through Brazil‘s nowhere-land for more than 100 kilometers. Then, I pushed my personal challenge for adventure and endurance to a whole new level: I went to the Philippines to open Impact Hub Manila. Smart decisions probably look different…. Doing business in Manila is about the opposite of what it is to do business in Switzerland: incredible speed, fast negotiations, bureaucracy and corruption hindering you from getting things done, laid-back people (except in traffic…), the challenges of living in a Megapolis of 15 million people, dealing with some of the richest people of this world and with the poorest that don’t even own anything more than clothes – sometimes not even that. The impressions appear and disappear with the speed of looking out of a window while riding a train. Riding that train, you have to keep the overview and find answers to all the appearing questions: Which direction do we want to go? Do we still have energy? Which obstacles are waiting for us and how do we avoid them? Where should we stop, where not? Are our passengers happy; is the head office ok with what we’re doing? So, what does it take to open an Impact Hub? To become part of the global Impact Hub network you have to go through an onboarding process and at the end all Impact Hubs vote whether to take you on board and support you in your endeavor. Then you need money, a plan, supporters, and a location. Once you solved all of that and you’re probably already exhausted (that part took us more than a year), the troubles and challenges are starting, because you are turning your theoretical idea into real-life action. It’s quite logic that people that want money from you (suppliers, government, lessor) are more likely to appear at your door than the ones that have to spend money for your services (customers, sponsors, partners). But obviously your train only runs if you pay the energy for it with cash – and cash is king. And then, when you’re exhausted after fighting yourself through a jungle of bureaucracy, rules, regulations, laws, wrong deliveries, negotiations etc you open your doors. (I think I was less exhausted after that Gigathlon then on that day.) But that’s the day where your “return” is entering the door: the people that were waiting for this to happen. 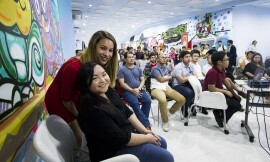 Impact Hub comes to a new city: Impact Hub Manila is opening its door. And then the real train-ride begins…. 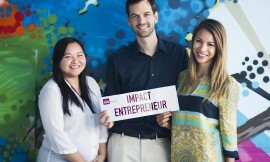 At every Impact Hub, the people are the core! A full house at their opening.